Labor Day is coming and most people, especially in the working sector, are busy preparing events and parties to celebrate this special day dedicated to them. It is an annual national holiday observed in many countries to commemorate the important contributions of the work force to the society as they bring dynamics to the economy. Although it is celebrated on different dates in various countries, the first Monday of September is designated as this certain occasion in all the states of America. Observing Labor Day means a day off for all workers and they can spend it with family and friends. It also marks the end of summer. And what better way to celebrate it than to organize parties and events, big or small, where everyone can enjoy quality time with each other away from work. So, if you’re planning to hold Labor Day parties in your area, here is a collection of exciting and printable party flyer templates that you can use to announce and invite people to your event. Take a look at these items and make sure to take your pick. 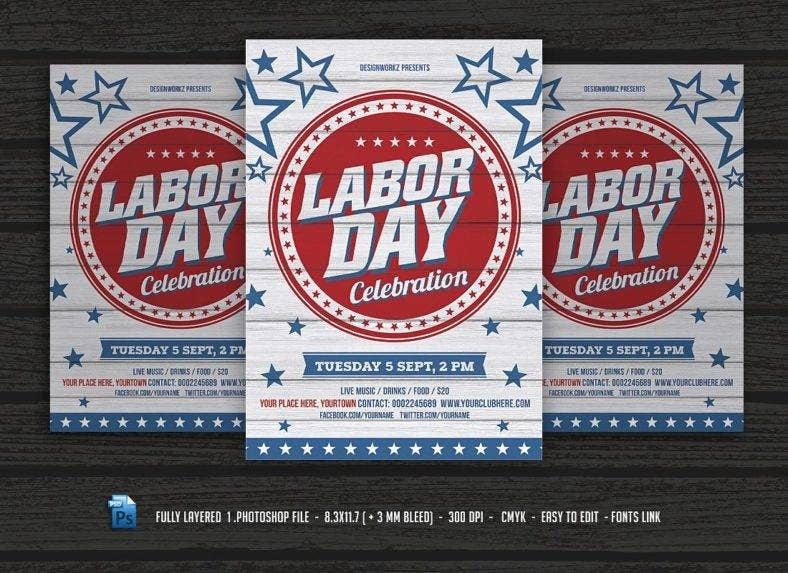 To start with, here is a bold and striking Labor Day celebration flyer design that comes in two color variations to choose from. It is packed in Ai and PSD CS5 file that is set on an A4 size with bleed and fully ready to print. You can also easily customize the template by changing the color, image, text, and other elements according to your liking. A great way to represent the work force is linking them into an eagle. They are strong and trustworthy. 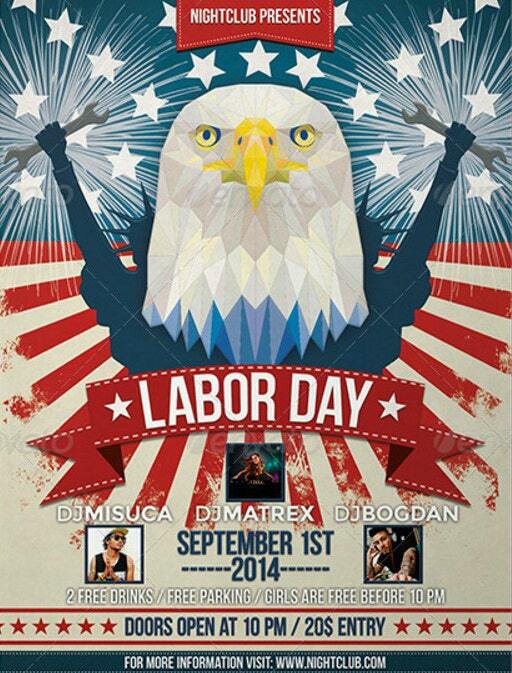 So, here is a Labor Day party flyer that does just that and made this vigorous creature the center of the design. With an image of the American flag in the background, this template surely embodies the true American worker spirit. 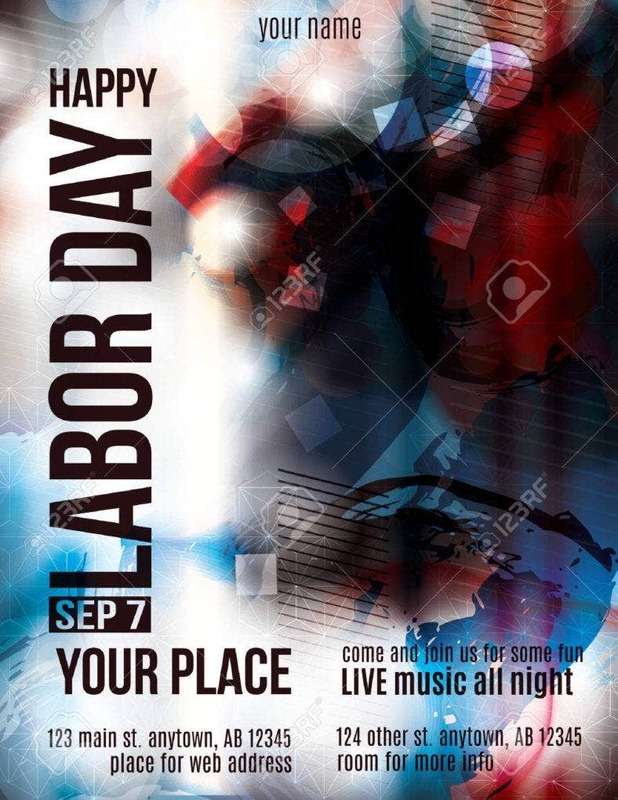 Next is a modern Labor Day flyer template with a dark grungy theme that will surely captivate the young generation of workers, but more especially, those that are young at heart. It has minimal content with all the essential details placed in the merest but strategic places giving emphasis on the colorful background which exudes both mystery and fun. 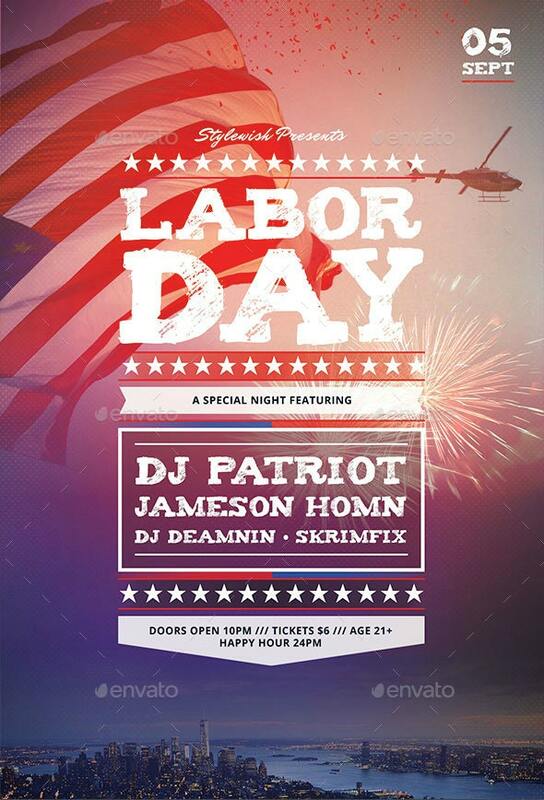 Here is another modern flyer template for your Labor Day celebrations but with a classic twist. It uses traditional design elements such as ribbon strips and bold texts over a contemporary design system. It gives you the perfect promotional material as it comes with 3 background color options and easy-to-customize content. 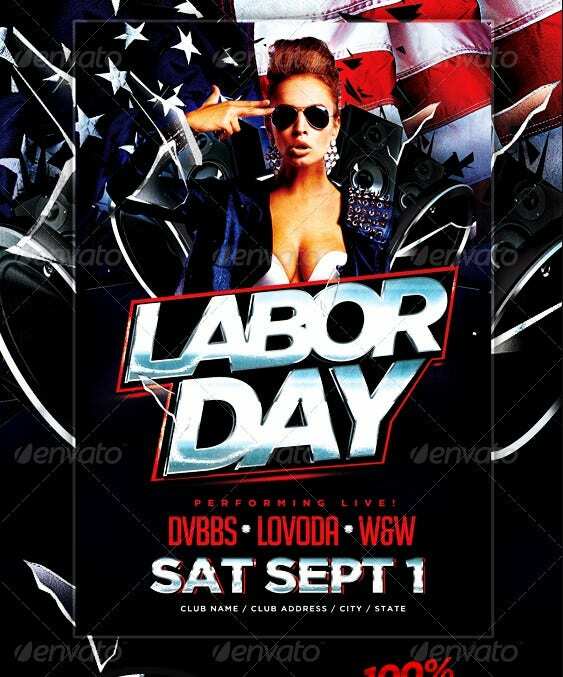 On the other hand, the Labor Day party flyer you see above is sleek, clean, modern, and dark. Perfect for any underground party events with lots of booze and loud party music. It comes in a print-ready PSD file with well-organized layers in a color-coated folder for easy customization. The flyer size is 4 x 6 inches with bleeds and uses CMYK color mode and 300 dpi resolution. 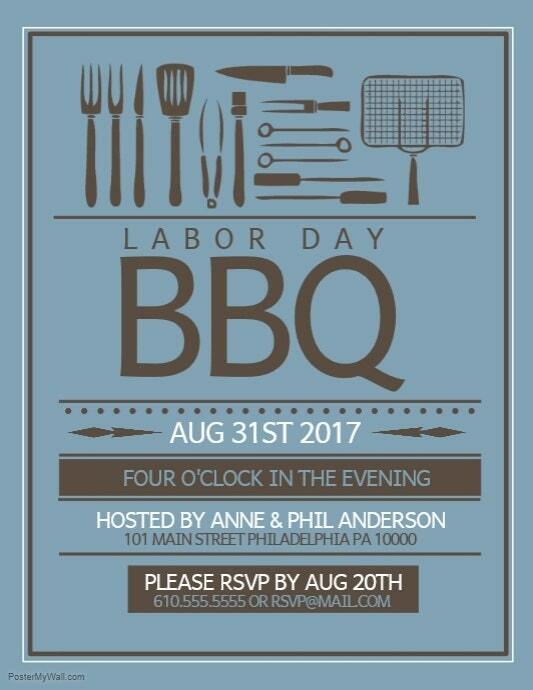 Then, here’s a Labor Day barbecue party flyer that is characterized with a flat design thanks to the vector illustrations integrated into the template. It is quirky and whimsical guaranteed to catch attention and interest. The template is in a horizontal format, so you can also use it as a Labor Day card, an invitation, or any way you want. 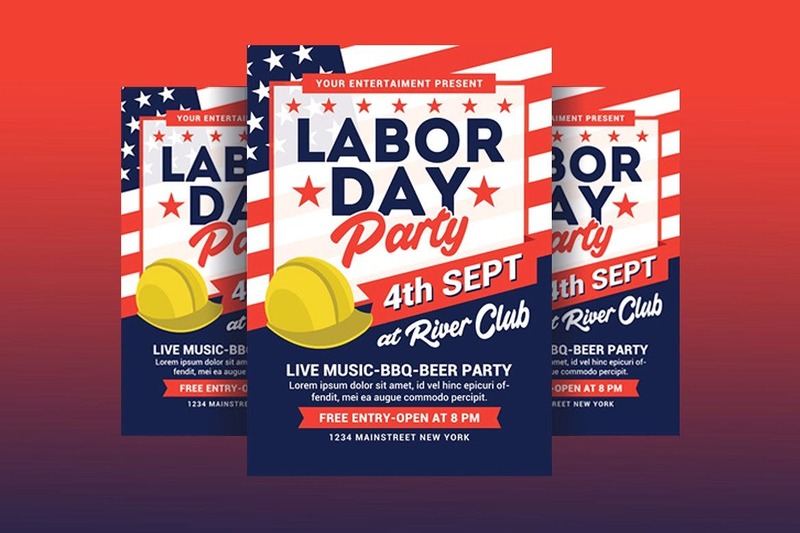 With a clean grunge design and all American elements, this party flyer template is perfect to use to announce your Labor Day weekend events, whether you’re holding a dance party, club or bar gatherings or barbecues with friends and families. This template is very easy to use as it comes with an organized and color layer structure to quickly customize all elements. 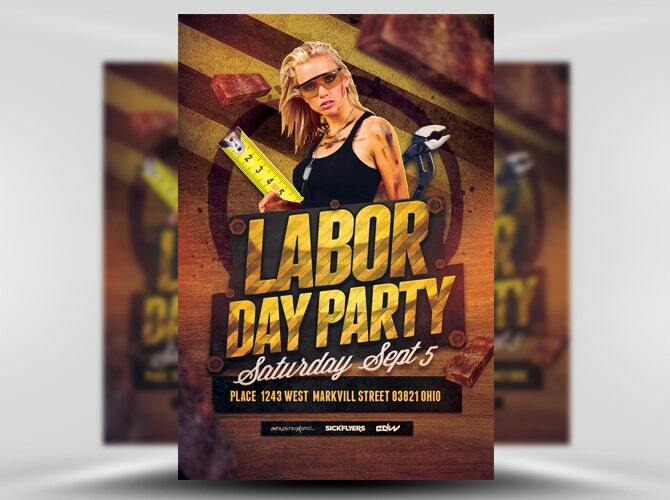 For concerts, night clubs or any mainstream music events for Labor Day, here is a gritty and rough party flyer in PSD that uses elements which remind people to stop what they’re doing and enjoy their special day. It comes in an A5 size with bleeds at each border and PSD layered so you can change the text, change colors, move items, etc. pretty easily. 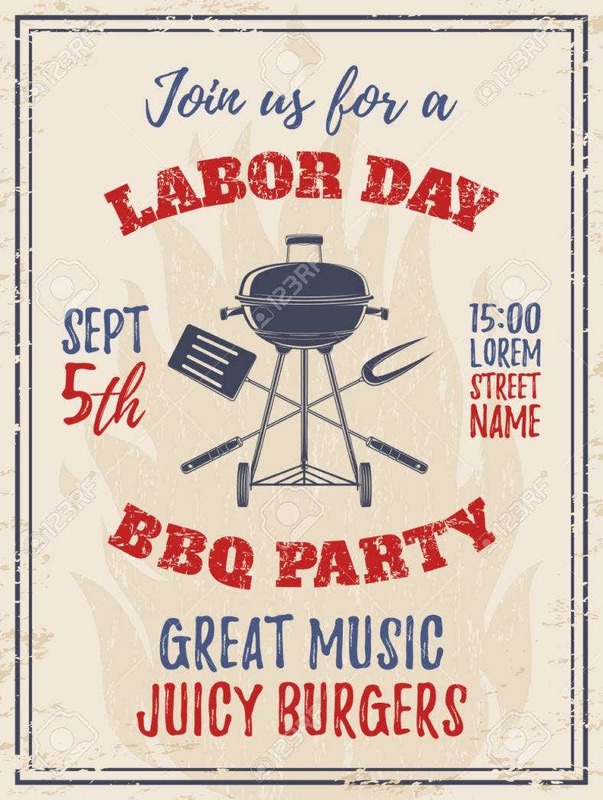 Another Labor Day BBQ party flyer template, this time with a modern graphic design that is easily noticeable because of its strikingly-colored texts and eye-catching illustrations over a white background. 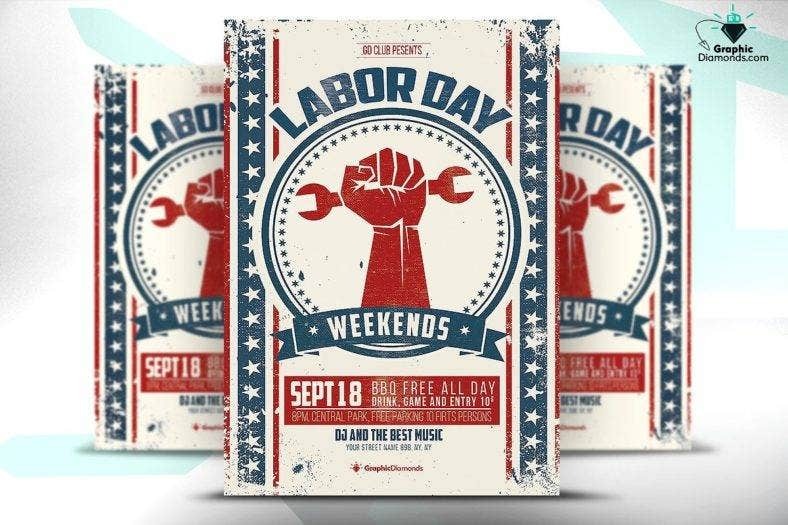 With an adjustable size, you can also use this template as a Labor day barbecue poster, brochure or an invitation template. 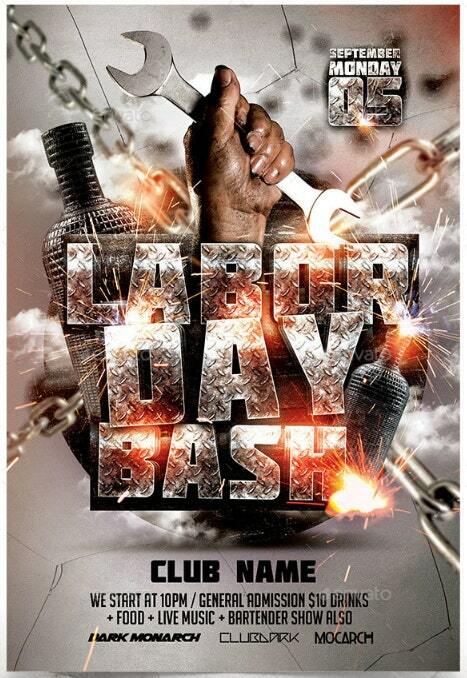 Labor Day bashes require an equally robust party flyer such as the template you see above. With a serious industrial-style design, it perfectly represents all the dedicated and hard-working laborers in the country. This template is fully editable and lets you customize all the text and image areas very easily and use it however you want. For a little bit of fun and uniqueness, you can also use the image of the equally hard working man’s best friend to inspire and draw a crowd to your Labor Day party. This one-of-a-kind template can be used as a music and dance party flyer with a customizable design that features free fonts and print-ready CMYK color layout and 300 dpi resolution. 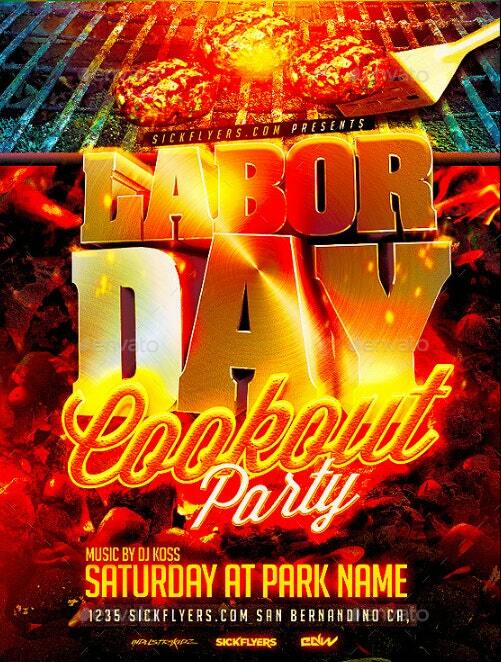 If you’re looking for a clean party flyer template with lots of white space to highlight its content more, above is another variation of the Labor Day BBQ flyer template from a previous item. 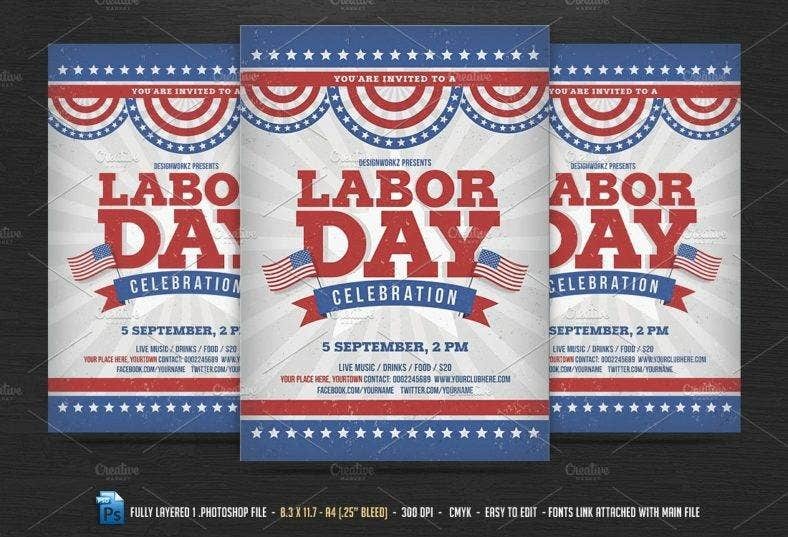 As a vector illustrated design, you can easily change the text and modify the content of the template to make it into a brochure or poster for Labor Day as well. With elements representing American pride such as the blue and red stripes as well as stars, this is quite a party flyer template to consider. 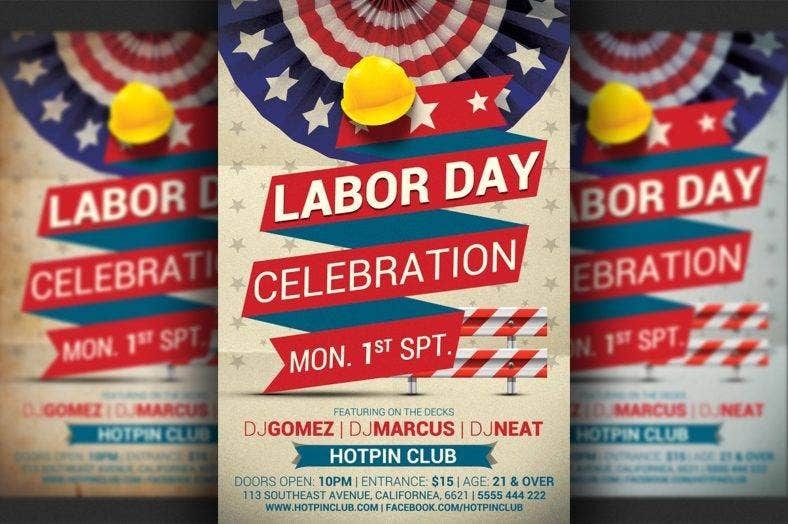 If you’re up with a festive look for your Labor Day celebration flyer, then, get this fully layered template which comes in A4 size with 300 dpi resolution and print-ready CMYK color mode. 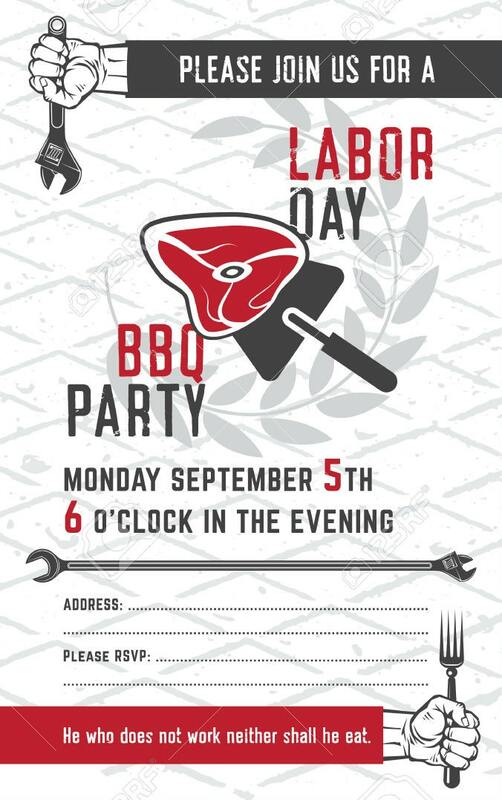 Fire up your Labor Day celebrations with this hot and fiery cookout flyer template. Burning with well-structured and layered elements in color-coordinated folders, this item is super easy to modify so it suits your needs and preference. Although, we could say there’s nothing to change in its already great and striking design. 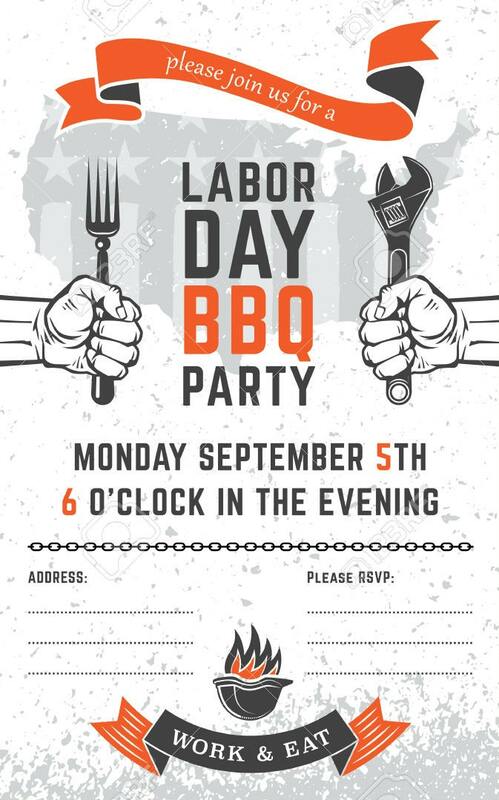 On the contrary, we have this vintage event flyer template specially designed for Labor Day barbecue parties. It has a simple, yet attractive design that your neighbors, family, and friends can’t deny coming and joining your little Labor Day shindig. Vector illustrated, the template is easy to modify so you can change the content into the correct details. Next is this bright and stunning Labor Day party flyer with a modern design that will definitely draw everyone’s attention and interest. It has quite a polished and professional feel that it can be used as invitation flyers for official and government sponsored Labor Day activities like parades, showcases, and many types of celebration. 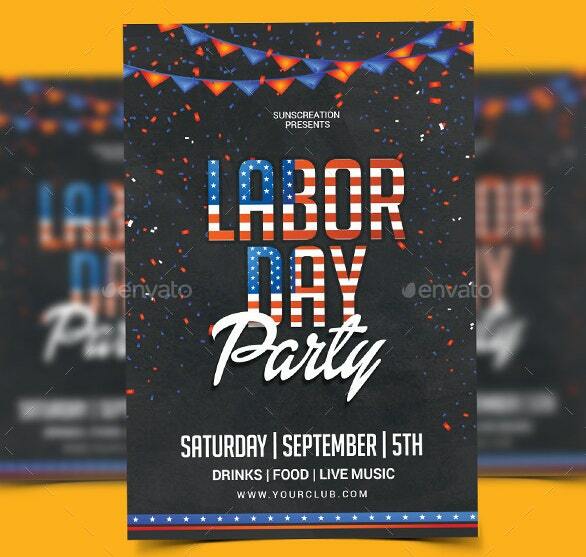 This Labor Day celebration flyer is another engaging invitation flyer template that uses colorful elements and exciting fonts over a black background. Downloading the template package means you get a fully layered, renamed, and grouped PSD file, so you can edit the text and other vector elements without difficulty. What other way to represent the American working people than having “Uncle Sam” telling you to party your heart out? This one-of-a-kind holiday party flyer template is filled with American patriotic themed elements that scream an all-out American party. Gather your family and friends using this party flyer and have the best Labor Day festival ever. Shining and dazzling, turn the spotlight to your event and draw the crowd with this gorgeous Labor Day celebration and event flyer laden with lots of stars from the only American flag. A personal favorite, this template includes a fully layered PSD that you can customize easily. Insert your own details on the pre-defined text areas, and you’re done in minutes. 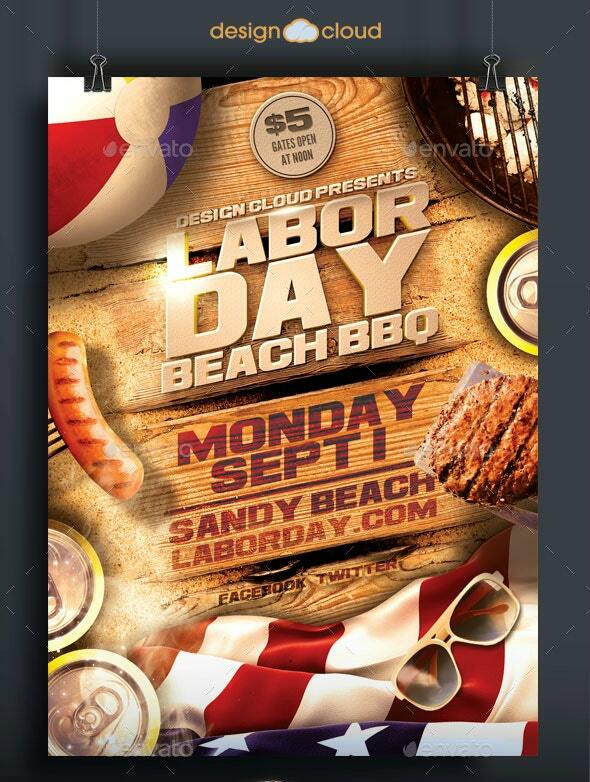 Now, here’s an amazing beach party flyer template for Labor Day that you can’t resist. Easily recognizable and spectacularly striking, this template is hot and perfect for any holiday celebration at the beach during summer with some barbecues. With smart object layers, you can update the flyer with your own details in a snap. 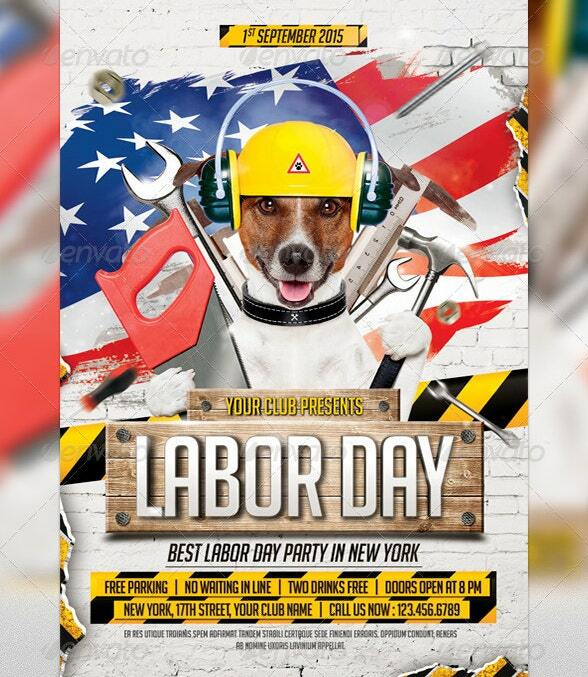 This rustic Labor Day party flyer captures the true essence of the occasion through its construction worker-themed design. The template is designed in order to celebrate the achievements of American workers who built the country as it is today. It’s a premium PSD template that has a fully editable image areas and easy-to-customize text fields. 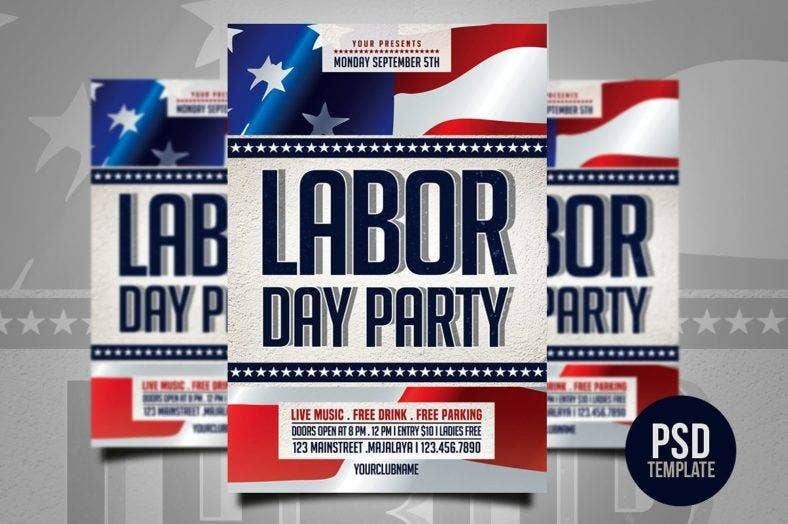 Although this template may look complicated, it is a simple Labor Day flyer with a clean and simple approach to the design highlighted with bold texts which dominate the whole design. 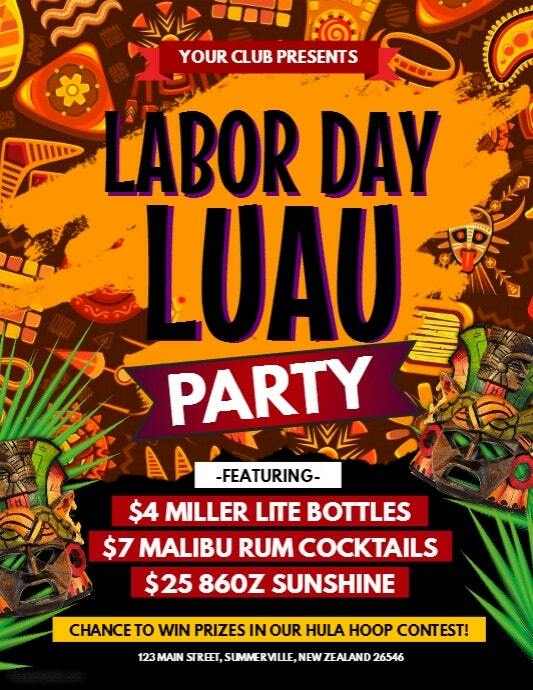 If you’re an entertainment establishment such as bars and clubs who want to celebrate Labor Day with your patrons, then this event flyer is the right one for you. 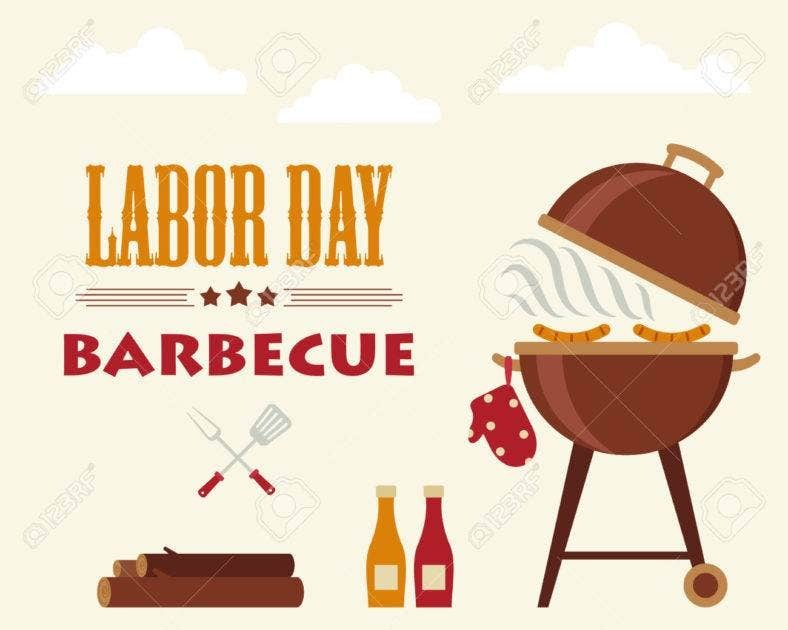 On another note, above is a Labor Day bash template featuring industrial elements such as chains and metallic fonts as a basis for its overall design. Unlike the regular red, white, and blue color scheme of most American holiday-related designs, this template offers a unique take on the occasion. All its texts and elements are editable and easy to customize. 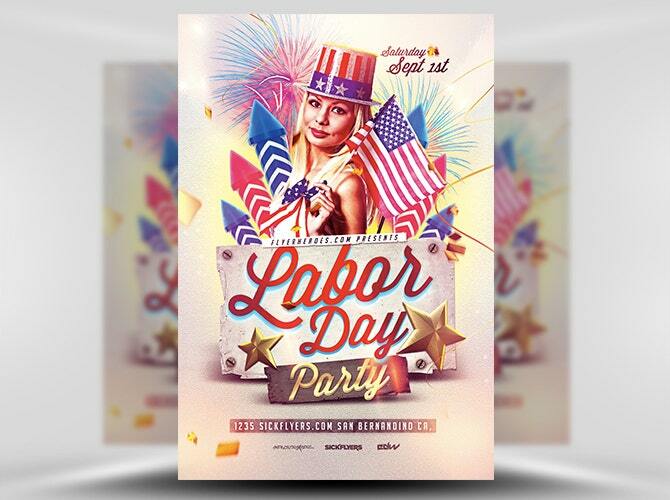 Using red and blue as well as the white stars from the American flag, the overall style of this party flyer template is very reminiscent of the true purpose of the celebration during the Labor Day holiday. Easily modified, it is a perfect choice to use if you’re hosting patriotic parties to commemorate the hard work of every American worker. 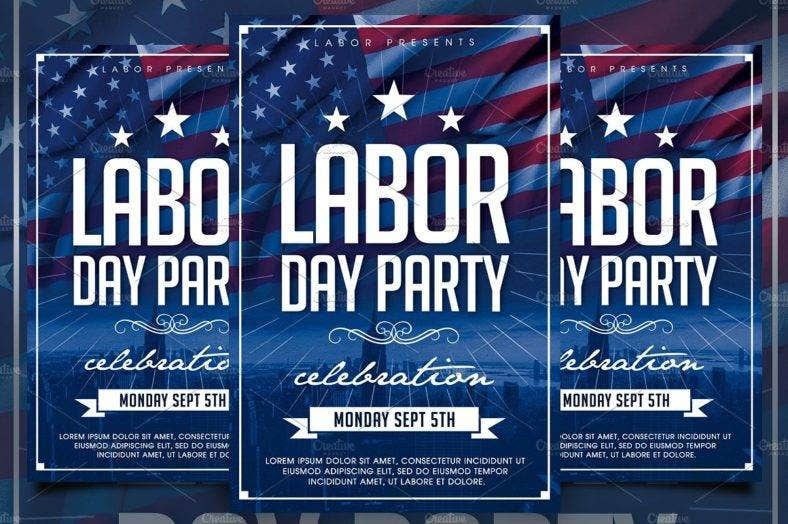 Another patriotic Labor Day party event flyer with its bright and vibrant color scheme with other nationalistic elements like stars and stripes. The hard hat image reminds people to whom this occasion is celebrated for. 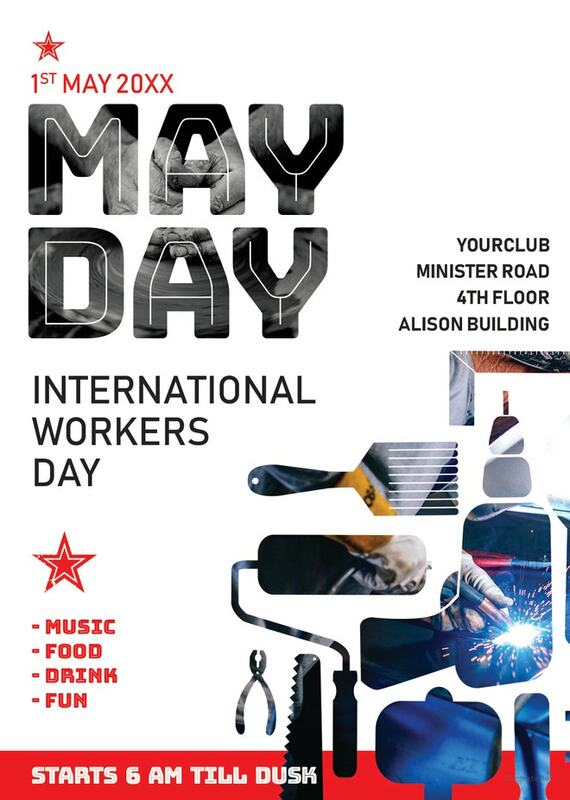 It’s great for celebrating the holiday in night clubs and bars where most workers come to enjoy a drink and a chat outside of work. 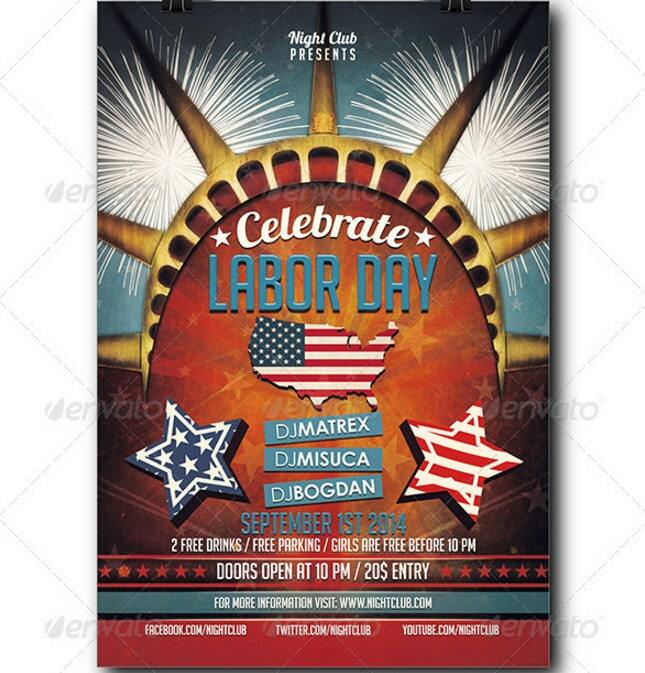 Speaking of vibrant, there is no other electrifying party flyer design than the Labor Day party flyer template above. With a scenic background comprised of true American elements, this well-organized PSD flyer template comes in 3 color variation, so you can choose a template that suits your taste very well. Who says a luau party can’t be done on Labor Day? Well, it’s no contest as Hawaii is very much part of the United States of America. Yet, you can always put up a luau party whichever state you are located. So, bring your friends and family together or bring out a crowd to your favorite hangout place with this colorful and fun flyer template. 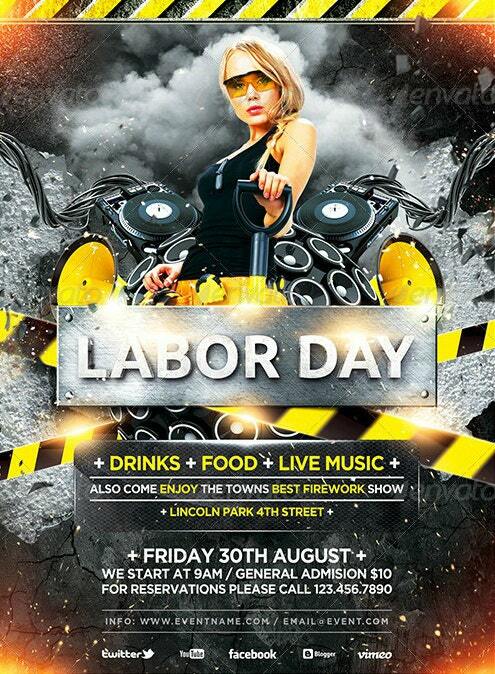 Next is a graphic Labor Day party flyer which provides a straightforward take on its design. Even though there is a number of image elements on this template, the entire page is filled with text which allows you to insert a lot of essential details and more information regarding your event. Moreover, all of its text and image areas are fully editable and very easy to customize. Another way to symbolize this joyful American holiday is to use an image of the Statue of Liberty. 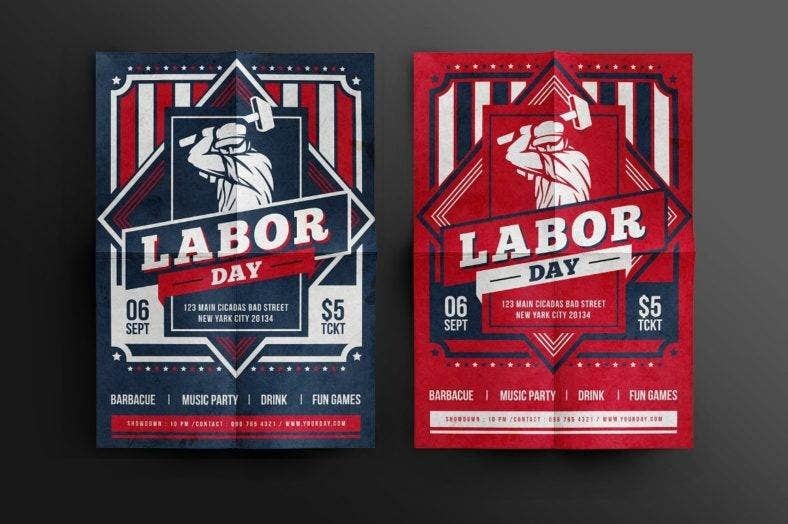 As it represents freedom and leisure, it is great to use as a design basis for Labor Day party flyers, along with other elements such as the American map, flag, and stars. With a great combination of colors and text fonts, this is a fabulous party flyer template to boot. Last but definitely not the least, here is a minimal party flyer with a three-tone color scheme and a clean and modest layout. Despite its simplicity, this modern flyer template actually works like no other. With less clutter and a rather straightforward approach, all the information are displayed well so that they are easy to read and hard to miss. So, there you have it. 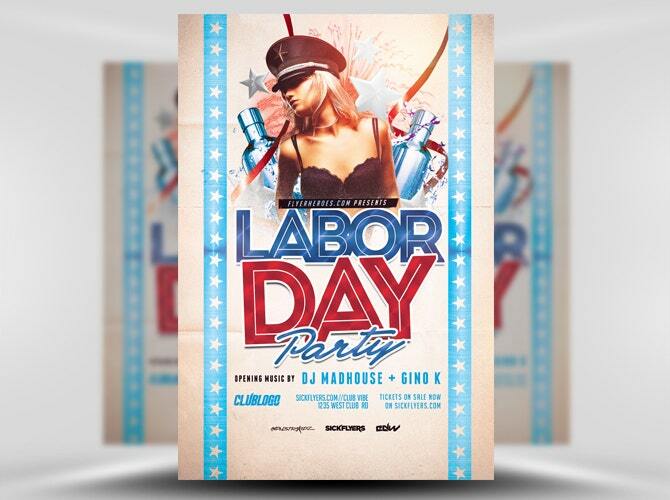 Never hesitate and make sure to get one of these party flyer designs for your planned events this Labor Day. Guaranteed easy to use and customize, you will never have any problem creating your party materials for this upcoming holiday.